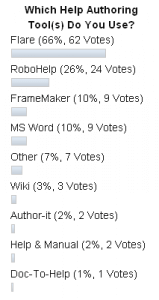 Help Authoring Tools Poll Update | Writing Assistance, Inc. Writing Assistance, Inc. I am a full time staff technical writer. I use MS Word for Release Notes and User Guides. I use RoboHelp9 for online help. I love Snagit for screen captures. 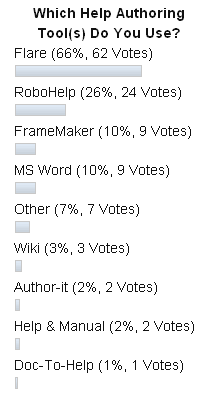 I have used Framemaker in the past. Several non-writers in our group like to use Excel for their writing projects! I can’t imaging having to use Excel for writing projects – wow! Agree Snagit rocks – not only for screen captures, but I find it amazingly capable for resizing images quickly. It has become my go-to photo editor.